First read the “Skemmi-QuickStart.pdf” (how to install OpenInterface and first steps into skemmi environment) and “OpenInterfaceDeveloperComponentGuide.pdf” (how to implement a new component). Now, here is a step-by-step on how implement OpenVibe VRPN server in OpenInterface. The second step of the IP will be to use the data (received from the sensors) into an application (like a multimedia application). There is most chance that the SDK used to get the data from the sensors and the SDK used to develop the application (or any elements in the chain) doesn’t use the same langage ! For example, we may need to use a c++ SDK to get the data from a sensor, do a signal processing with a java library and use the resulting data in a musical software who uses OSC messages. All the members of the team will be in charge of one of these processes and it could be difficult to combine all the processes in the end. It is the reason why we could be able to use OpenInterface. As said before, the OpenVibe option is more flexible. So we prefer using it in a first time. We will not explain how OpenVibe works and all its features, all this information are available on the OpenVibe’ website. We will just explain how we can interface the Emotiv Epoc, getting back the signals and sending them into an other application using a VRPN server. Designed especially for the headset, the SDK included many tools to use it. The Emotiv tools focus on the detection of emotions. We have to calibrate the headset with the panel control and then, we can get back the information in a c++ application using Emotiv library (all information about using the library are available in the documentation of the SDK). At the moment, we don’t know yet if it’s possible to get the raw signals with this SDK . OpenVibe is an OpenSource software designed for the Brain-Computer Interface (BCI). It can be used to acquire, filter, process, classify and visualize brain signals in real time. It is possible to interface directly the Emotiv Epoc and getting the raw signals (but it’s necessary to have the Emotiv SDK installed). Unlike the Emotiv SDK, It’s not directly possible to determine the emotions. However, processing options are more flexible (we can get the raw signals and do all processing we want). For the IP, we have to use different sensors to create a human/machine interface application. The list of the sensors that we will use is not yet fixed but it’s almost certain that we will use the Emotiv Epoc. What is Emotiv Epoc ? 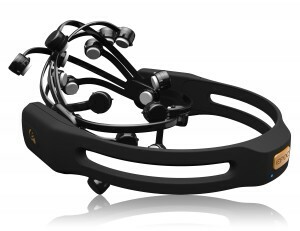 “The Emotiv EPOC is a high resolution, neuro-signal acquisition and processing wireless neuroheadset. It uses a set of sensors to tune into electric signals produced by the brain to detect player thoughts, feelings and expressions and connects wirelessly to most PCs”.